Toggi Langley Country Boots. The Toggi Langley is a handmade long, luxurious full grain and nubuck leather country boot. 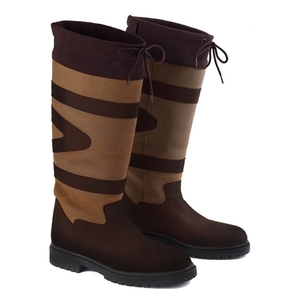 With a Puratex waterproof and breathable membrane, these boots ensure you remain dry and comfortable in all weather conditions. The dual–density cushioned insock provides exceptional comfort for all day walks in the Countryside immaterial of the weather! Love these boots. Have only worn them once as they are brand new. I always buy Toggi as they become incredibly comfortable with wear as they mould to your foot.